Sometimes the misfortune of some makes the happiness of others. This sentence applies perfectly to Fabian Delph this season, who came in Manchester City first team following the injury of Benjamin Mendy in September. It should be remembered that during the summer of 2017, the English club spent a lot of money in defense sector with arrival of Kyle Walker, Danilo and Benjamin Mendy, today the most expensive left-back in history. Moreover, with David Silva, Kevin De Bruyne – playing more deeper than their usual position – Fernandinho, Ilkay Gundogan, Yaya Toure or Bernardo Silva, the chances that Fabian Delph could play a major role were weak. However, with seven consecutive starts, the 27 years-old player became a key in Pep Guardiola defence and his team always prevailed when he started a game. In 2015, Delph, a midfielder of Aston Villa and trained in Leeds, is bought about twelve million euros by Manchester City, which spends (already) without counting to continue its momentum (champion of England in 2012 and 2014). Nevertheless, the little guy (1,74 meters) is not going to have much opportunity. Between a failing body (eight injuries since his arrival at the Sky Blues), a difficult adaptation and a level of play that leaves something to be desired, Fabian is a flop. In two seasons, he is lined up only ten times in the eleven type in the Premier League, and only twice in the Champions League. Transitioning a player from one position to another it’s something Pep Guardiola is used to. In FC Barcelona, he is the first to played with Javier Mascherano in central defence who was used to playing in midfield, in Bayern Munich he put Philipp Lahm into the midfield or in Manchester City recently, playing with David Silva and Kevin De Bruyne a little a bit deeper than where they were use to be. Guardiola’s hand is felt all the more with the system he puts in place. Starting with something seems to be a 4-1-4-1, his squad is turning to a 2-3-2-3 in possession phases with Fernandinho coming down between the two centre back (like Sergio Busquets in Barcelona), the left and the right back taking place into the midfield. This is a very aggressive setup, and using Fabian Delph help the team to stay compact in the midfield and maintain width during possession. It let Leroy Sane take the left wing, while Fabian Delph and Kyle Walker play as midfielder, letting David Silva and Kevin De Bruyne free of defensive tasks. This tactic is reminiscent of what Guardiola were already doing at FC Barcelona, putting a lot of pressure on the opponent. There’s nothing new in Pep Guardiola mindset. Nevertheless, this tactic would be nothing without Fabian Delph intelligence. Fabian Delph has a lot of experience in Premier League, he was previously used as a box-to-box midfielder, and he is a strong runner and a good short passer. Therefore, the choice of Fabian Delph as left-back, while there is Danilo who is more suited for this position, is perfectly justified in Guardiola formation, which need intelligence and technical qualities to perform. Moreover, he is different from his other side mate, Kyle Walker, and he has a large volume of play. His good performance undoubtedly influenced Leroy Sane, who earned the EA SPORTS Player of the Month award (October). Pep Guardiola had the intelligence to choose Fabian Delph a as left back, and he use him like Jordi Alba in Barcelona or David Alaba in Bayern Munich, who are now among the best at their position. 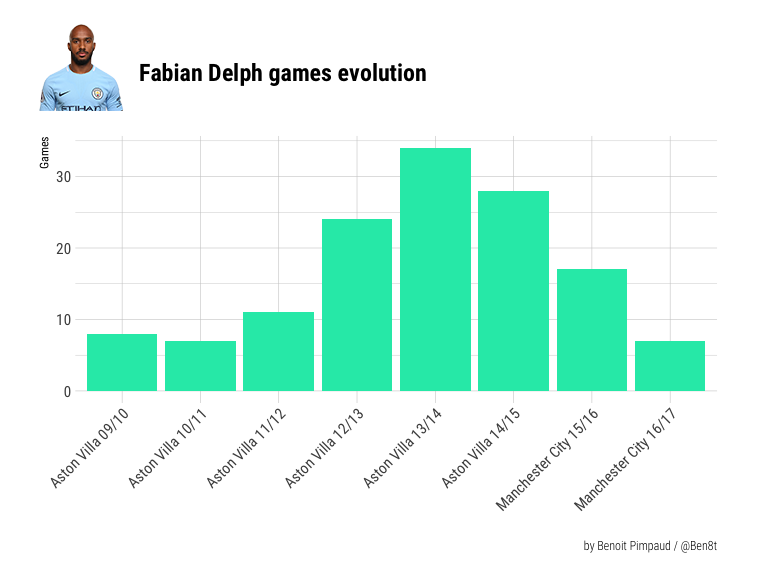 The future will tell if Fabian Delph will be able to continue to play this way. Take the place of left back definitively, even at the return of Benjamin Mendy, would be difficult because he will probably never had the modern left back workload to stay at this position. Nevertheless he could be a good alternative on the bench when Manchester City will be in trouble or when a tactical change will be needed. In any case, it’s nice to see that a simple tactical adjustment can reveal (again) the talent of a player, and that could give ideas to an English team that needs tactical and collective freshness in view of the 2018 World Cup.